Another absolutely priceless transmission from the Sublime Frequencies label, and without doubt one of their best so far. 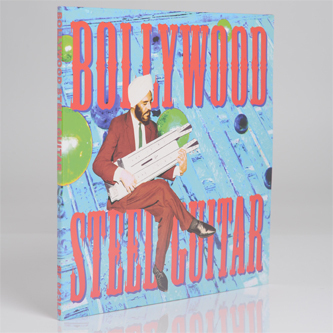 Bollywood Steel Guitar is the most comprehensive collection to date of steel-guitar pop music from India. All 21 tracks featured here were film hits from 1962-1986 and all the masters of the steel guitar sound from the period are represented: Van Shipley, Kazi Aniruddha, S. Hazarasingh, Sunil Ganguly, and Charanjit Singh. An entirely different approach that rocks, swings, and fizzles through some of India's most beloved film tunes, the electric steel guitar as lead instrument transforms the already infectious melodies into a multitude of higher sound dimensions. This CD was compiled and carefully selected from rare LPs over several years by Stuart Ellis. Here are some excerpts from his liner notes: "These songs are, for the most part, the pop music of India. As with most popular music, other artists sometimes recorded cover versions of these songs. Of these musicians, a small number specialized in instrumental arrangements and created what could be called the elevator music of India. While there were a few who used the harmonium or 'mouth organ,' the most popular instrument used in these 'instrumental favorites' was the steel guitar." The result is a collection of insanely good, multi-discipline pop gems that it's impossible not to fall in love with, another one of those records for serious music lovers who are looking for untouchable party music from the furthest nether regions of the archives. Incredible stuff - Essential Purchase!